CeBIT is the global tech event or a meeting place for all organizations or professionals in the field of computer and IT sectors. It is an annual conference or trade-show held in Hannover Exhibition Grounds, with the 2016 edition confirmed for 14th -18th March. CDN Software Solutions is consistently delivering innovative solutions, always thinking of new ideas and apply the flavor of latest technologies in our work. Our delegates Mr Chetan Naik (Founder of CDN Solutions Group), Mr Surajit Mitra (CEO of CDN Solutions Group) Ms Anubha Barod (Key Accounts Manager) are very much excited for this event. 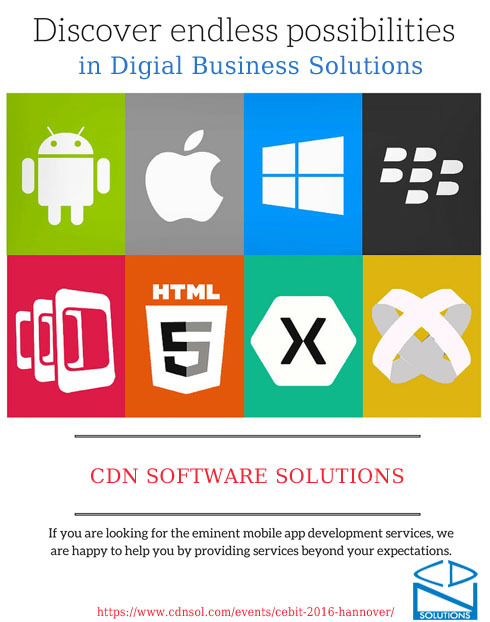 So meet CDN Software Solutions at CeBIT for your solutions related to Web and Mobile in Hall 2 Stand no C 36 at Hannover Exhibition Grounds during 14-18 March, 2016. If you are not exhibiting in this event, but want to attend it , contact us here to get your free guest pass for this superb IT show and also get the best solution for your business.